Another technology for direct wireless connection of devices is Bluetooth. It connects devices at a maximum distance of about 30 feet for simple tasks, a process called pairing. On the Tab 4 NOOK, you can use the Bluetooth radio to share photos, contacts, music, and other files. The technology is, of course, named after Harald Bluetooth, the tenth-century king who united ragtag Danish tribes into a single kingdom, apparently with the aid of a wireless tablet of some sort. True — at least the name part. To protect your tablet from receiving unwanted pairing requests, don’t let it be found by other devices until you agree to let it be discovered. 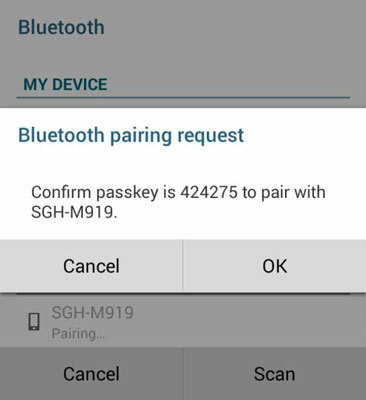 Here’s how to establish a Bluetooth pairing. These steps deal with turning on the Bluetooth radio in the Tab 4 NOOK; make sure the equivalent radio is turned on and made discoverable on the other device. Tap the Bluetooth (angular B) icon to turn on the radio. Under the My Device section, you should see the name you gave your tablet. Tap to place a check mark in Tap to Make Visible to Other Devices option. On some systems this is called making a device discoverable. Look in the Paired Devices section. For a previously paired Tab 4 NOOK, the other device should be listed there; if the system has discovered a new device, tap it to initiate a connection. 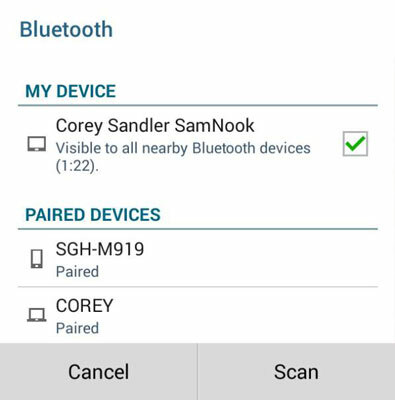 For a previously unpaired Tab 4 NOOK, look for the security code on your tablet’s screen. Make sure it’s the same on the other device, and tap your approval on each. When you’re finished with a Bluetooth session, simply turn off the Bluetooth radio or the device. From this point forward, because you have established pairing, the two devices will automatically reconnect anytime both are within range and their Bluetooth radios are on. Bluetooth radios use a lot of battery power. Turn off that function when you aren’t using it. Once again, the hardware capabilities of your Samsung Galaxy Tab 4 NOOK may not be equaled by the software or operating system on your tablet or on a computer or other device to which you connect. Some but not all computers, smartphones, or other devices let you transfer files in either direction with a tablet. Check the settings of Windows, Android, Apple’s OS X on its computers, or Apple’s iOS on mobile devices to see what’s allowed. Transferring files using Bluetooth is not easy-peasy. Use Bluetooth for simple tasks like beaming music to an external speaker or headset. You can usually find a way to perform certain other tasks like syncing contact, calendar, and task information from one device to another, but you’ll find Wi-Fi or a direct USB cable connection much simpler and easier for transfer of files.